Chris Ballard, Minister of Housing and Minister Responsible for the Poverty Reduction Strategy, made the announcement today in Barrie, where he was joined by local MPP Ann Hoggarth. Simcoe County is receiving more than $14 million in new funding through the Community Homelessness Prevention Initiative. Integrated supportive housing to help people with specific needs access suitable housing. Last year, this initiative helped almost 40,000 families and individuals experiencing homelessness obtain housing, and helped over 115,000 families and individuals at-risk of homelessness remain in their homes. Preventing homelessness is part of the government's economic plan to build Ontario up and deliver on its number one priority to grow the economy and create jobs. The four-part plan includes helping more people get and create the jobs of the future by expanding access to high-quality college and university education. The plan is making the largest infrastructure investment in hospitals, schools, roads, bridges and transit in Ontario's history and is investing in a low-carbon economy driven by innovative, high-growth, export-oriented businesses. The plan is also helping working Ontarians achieve a more secure retirement. 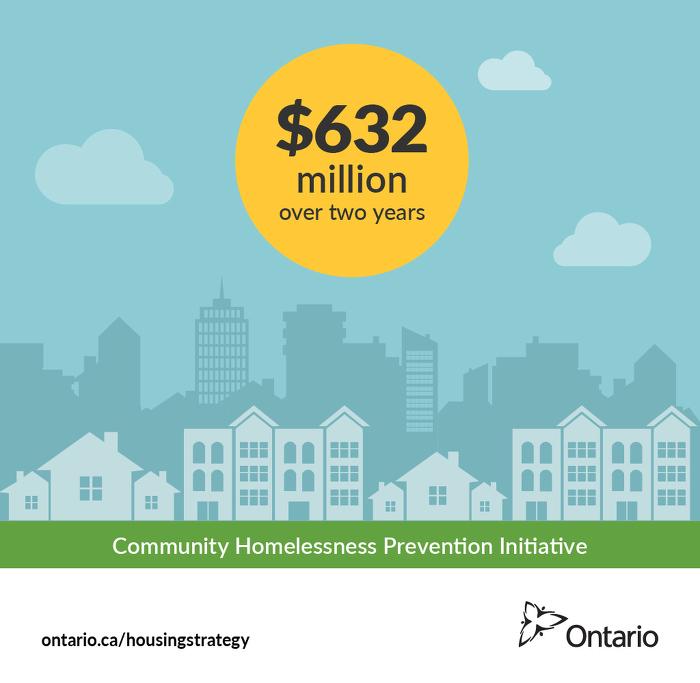 The Community Homelessness Prevention Initiative (CHPI) builds on Ontario’s Long-Term Affordable Housing Strategy and is transforming the housing system by helping those experiencing homelessness obtain housing, and those at-risk of homelessness stay in their homes. Every $15 million invested in CHPI is estimated to support about 2,600 individuals and families experiencing homelessness to obtain housing, or allow 14,200 households remain stably housed. Since 2003, Ontario has committed more than $4 billion to affordable housing. This includes the recent federal-provincial partnership to extend the Investment in Affordable Housing program. Ontario is supporting the creation of more than 20,000 affordable rental housing units, making more than 275,000 repairs and improvements to social and affordable housing units, and providing rental and down payment assistance to over 90,000 families and individuals.